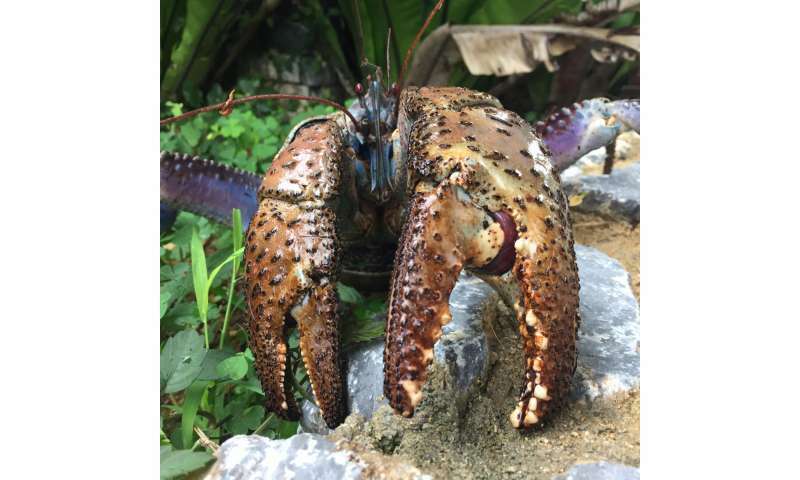 The claws of coconut crabs have the strongest pinching force of any crustacean, according to a study published November 23, 2016 in the open-access journal PLOS ONE by Shin-ichiro Oka from Okinawa Churashima Foundation, Japan, and colleagues. Coconut crabs are the largest terrestrial crustacean and are remarkably strong, lifting up to 28 kilograms. The crabs use their claws to fight and defend themselves, and to eat coconuts and other foods with hard exteriors. While decapods exert the greatest pinching force relative to their mass, the pinching force of coconut crabs was unknown. The researchers measured the claw pinching force of 29 wild coconut crabs from Okinawa Island, Japan. The researchers found that pinching force increased with body mass. Based on the crabs' maximum known weight, the maximum pinching force of their claws was projected to be 3,300 newtons. This exceeds both the pinching force of other crustaceans and the bite force of all terrestrial animals except alligators. The crabs' "mighty claws" let them monopolize coconuts, which other animals are unable to access. In addition, suggest the researchers, being able to hunt other animals with hard exteriors could help these crabs maintain their large bodies. Semantics Nazi Alert: Coconut crabs' claws have a stronger force than any other crustacean's. Or, of all crustaceans, coconut crabs' claws have the strongest force. "Strongest of any" doesn't make sense. Pick ANY crustacean. Do its claws have the strongest force? Only if it's a coconut crab.